The new Bellevue Main post office is scheduled to open at its new Wilburton location ( 12224 Bel-Red Road) on Monday, September 12th (former location of the Land Rover dealership). The current downtown location, scheduled to close on Saturday, September 10th, will reopen on Monday September 12. There’s no question the current post office is long overdue for either a major rehab or new location, but it is disappointing there will no longer be a post office in downtown Bellevue. I live downtown and its very convenient to be able to walk to the post office to deliver business and personal mail or holiday packages. Hopefully the new facility will have easy access and ideally more than just two windows open at any given time. As Realtors® we do more than just assist clients in buying and selling homes. Many of us, at the local, state and national level, are involved in supporting non-profit organizations that provide services and support to families and children in need. Windermere has recently partnered with the Seattle Seahawks as the official real estate company of the Seahawks. More important . . . this partnership will enable us to do even more for our communities through our new #tacklehomelessness campaign. For every home game tackle the Seahawks make, Windermere is donating $100 to YouthCare, a non-profit organization that provides services and support to homeless youth. Its going to be a great season, for so many reasons. Just in case you need a little help getting ready for the coming season, click the link below. GO HAWKS! 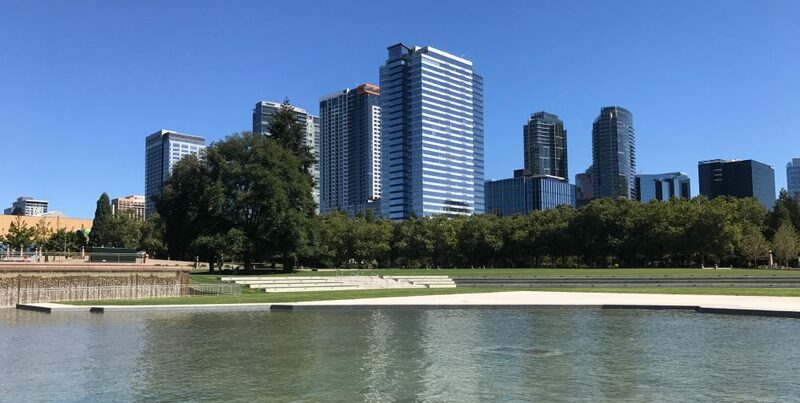 Downtown Bellevue’s condo market is on track for another year of active sales and increasing market values. During the first half of the year 113 resale condos* sold ranging in price from $237,500 to $1,750,000 reflecting a median sales price of $585,000. Those condos were on the market an average of 39 days with over half selling in ten days or less. In comparison, for the same period in 2015, 112 condo sold with a median sales price of $497,500. Market values are on track for another 10-12% increase this year. So far this month 14 downtown condo residences have sold. There are currently only 38 condos listed for sale (resale only) with prices ranging from $314,000 to $1,688,000. Market values will continue to increase, but there are still affordable condo options downtown. With apartment rents skyrocketing, it may be smart to visit the “rent vs. buy” numbers again and make an investment in downtown Bellevue. Construction is scheduled to start today at the Downtown Park to complete the canal and promenade circle and expand the playground. Completion is projected for June 2017. During construction the southern half of the Downtown Park will be closed to public access. The existing southeast parking lot will be accessible for limited use until the new 100th Avenue NE lot is finished. The parking lot along 100th Avenue NE will be temporarily closed to public access. During construction there will be intermittent closures of the northern half of the Downtown Park as improvements to the lighting and promenade are performed. The city, in partnership with the Bellevue Rotary Club, is expanding the playground to include an innovative play space where kids of all ages and abilities can play and explore at their own pace. Dedicated to fun, imagination and learning, it will be a universally-accessible play experience – a truly Inspiration(al) Playground. Today’s Bellevue Collection Bellevue Family Fourth, presented by PACCAR, kicks off at 2:00 with a variety of live music performances on the main stage, a kids fun zone and food and beverage trucks and stands. Go find the perfect spot to enjoy the day and fireworks display tonight. Fireworks are scheduled for 10:05 PM synchronized to a live performance by the Bellevue Youth Symphony. Make this a safe and fun holiday for everyone. Personal fireworks are strictly prohibited and pets are not permitted in the park after 2:00 PM. Leave your four legged family members at home where they will be safe and not traumatized by the noise.